Common to all rolled aluminium products are the properties of lightness, strength and durability. These three, coupled with other specific properties for particular applications, make rolled aluminium one of the most versatile materials available for the major markets of packaging, transport, and building and construction. 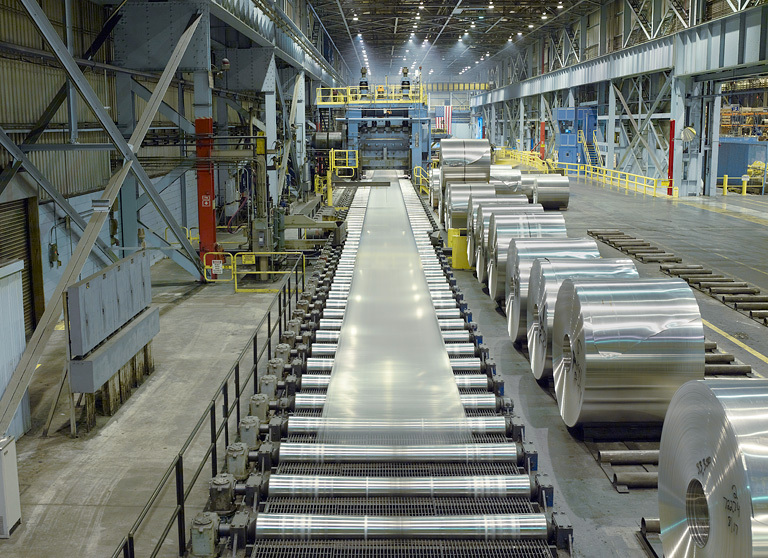 Rolling aluminium and its alloys is one of the principle ways of converting cast aluminium slab from the smelters and wrought re-melts into a usable industrial form. By hot rolling, it is possible to reduce a slab of about 600 mm thickness down to plate material with thicknesses of 6 – 250 mm and further down as low as 2 mm for subsequent cold rolling to sheet with thicknesses as low as 0.2 mm. Further rolling can produce the thinnest of foil with a thickness as low as 0.006 mm, approximately one-third the thickness of a human hair. 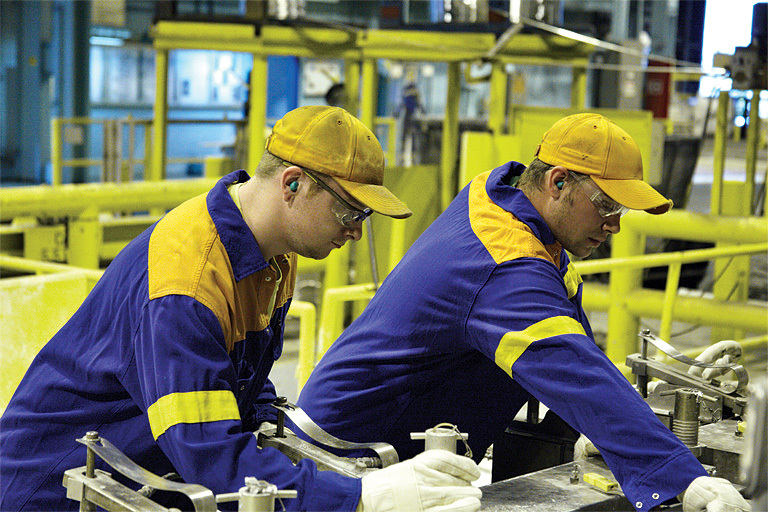 Aluminium slabs are heated to a temperature of around 525°C and then passed repeatedly through a hot rolling mill until either the required plate thickness is obtained or until the metal is thin enough (generally about 3 mm thick), to be coiled ready for cold rolling – the last 3 or 4 hot rolling passes are usually performed sequentially through a 3 or 4 stand “tandem” mill. From this stage onwards, right down to the thinnest of foil thicknesses, the metal is fed in coil form through a series of single or multi-stand cold rolling mills which successively reduce the metal thickness and recoil it after each rolling pass, ready for the next, until the required thickness is obtained. Annealing may be required between passes depending on the final temper (hardness) required. The rolling of cast aluminium changes its metallic structure and the metal takes on new characteristics and properties. The brittleness of the coarse, as-cast structure is replaced by a stronger and more ductile material, with the degrees of strength and ductility being variable factors that are functions of the amount of rolling (deformation) given to the metal, the rolling temperature, the alloy composition and the use of annealing. 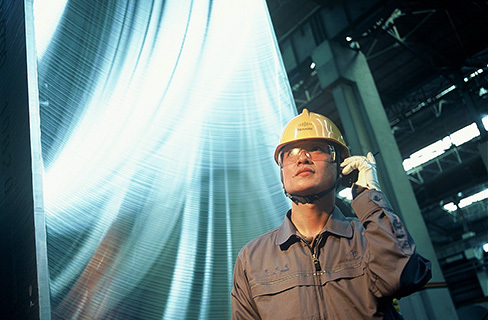 Commercial purity aluminium obtained from the smelting process has a composition of between 99% and 99.7% aluminium with the remainder made up of other constituents such as iron and silicon. Such metal when rolled is relatively soft and ductile. However by adding controlled quantities of other elements such as manganese, magnesium, zinc, copper and silicon to a melt of commercially pure aluminium, it is possible to prepare alloys that have a wide range of different properties and strength characteristics. 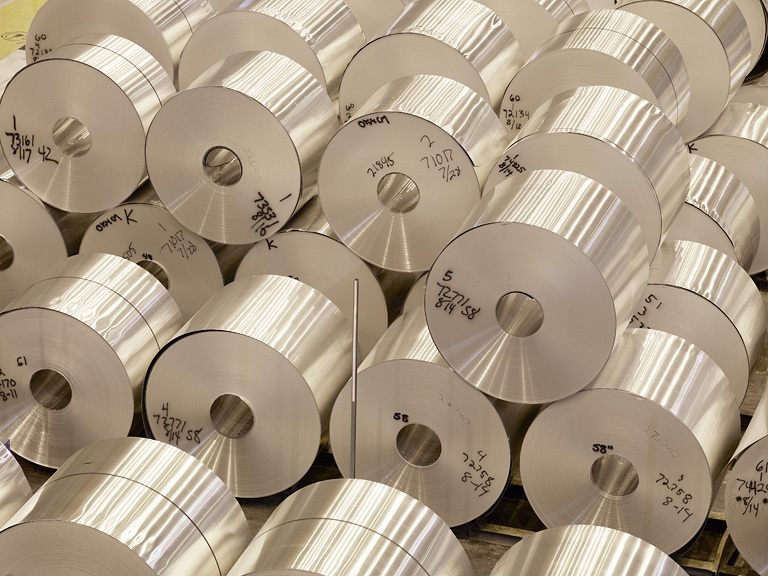 Many alloys have been formulated specifically for rolling to plate, sheet and foil. Also, by special refining of the metal during the smelting operation, it is possible to obtain aluminium with a purity of up to 99.99% which can be used for special products, such as reflector sheet and in electrical applications. These are special processes which eliminate the need for hot rolling and its associated high capital costs. 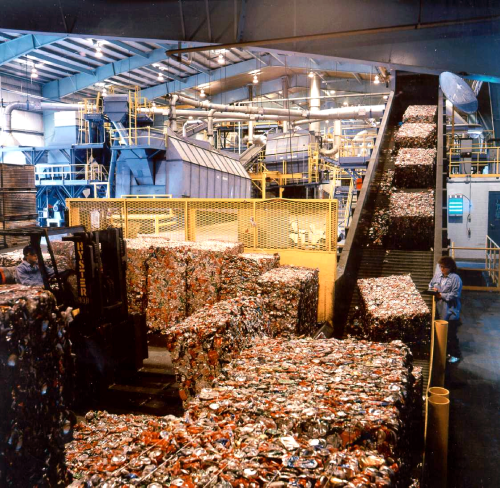 Molten metal is fed into a converging cavity set by two internally cooled, counter-rotating rolls. The process relies on the heat transfer between the solidifying (& compressed) melt and the roll surfaces to solidify the aluminium which results in very high cooling rates. Because of this, conventional twin roll casters have a limited alloy/product range - short freezing range alloys for fin, foil & building sheet. Molten metal is fed into a nearly parallel cavity comprised of two, internally cooled, counterrotating belts. The heat transfer is much lower than for TRC. Twin belt casters can be used for container stock, foil, fin, building products, and some medium strength alloys. It is now possible, with updated technology, to produce automotive stock in 5XXX and 6XXX series alloys. Today strip casting represents a significant and increasing part of overall aluminium sheet production (>1Millon Tonnes/yr). No single strip casting technology has yet been developed sufficiently well that it can meet all the property requirements for the full range of aluminium rolled products. Significant opportunities for important technical developments in the strip casting of aluminium alloys remain.